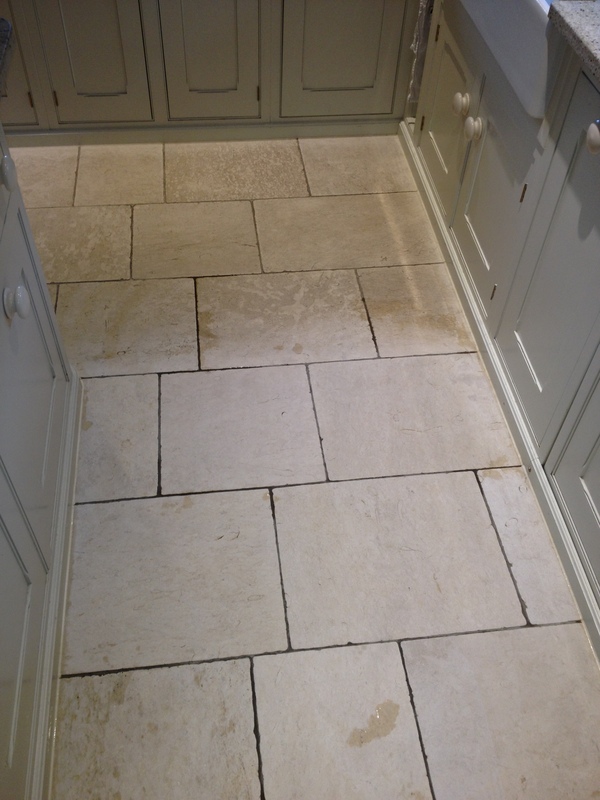 This Travertine tiled kitchen floor in Ottershaw, Surrey, was in need of a deep clean, strip out the old sealer and re-seal to ensure easy maintenance in the future. Being a high traffic area the tiles had accumulated a high amount of soil over the years. There was also marking from breakfast stools which are visible in the picture. 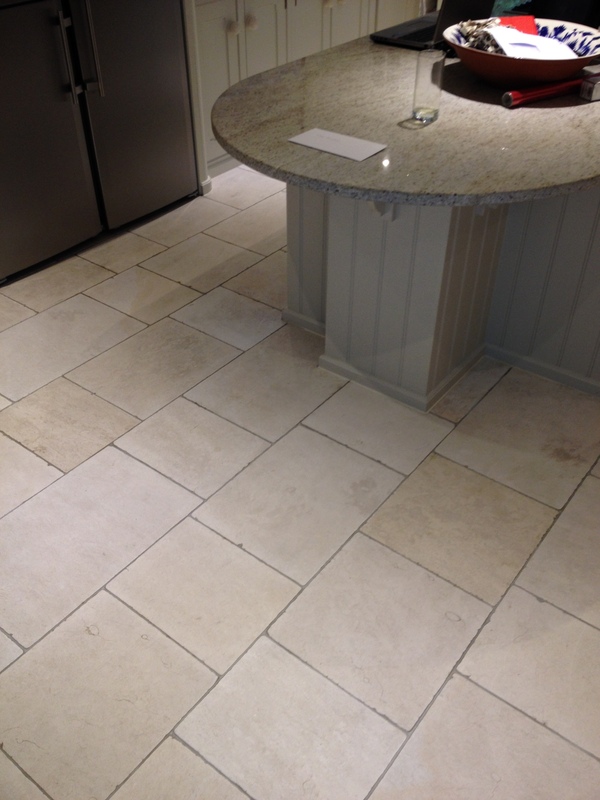 Firstly, I rotary machine scrubbed the floor using Tile Doctor Pro-Clean high alkaline cleaner. This broke down the soil and released it along with the remaining old sealer which was then pressure rinsed to ensure all of the dirt was removed from the pores. Following this, I used diamond encrusted burnishing pads to cut back through the stone and remove the marks from the chairs and fine scratches. After restoring the surface to a satin finish with the finer pads, the floor was left to dry out. 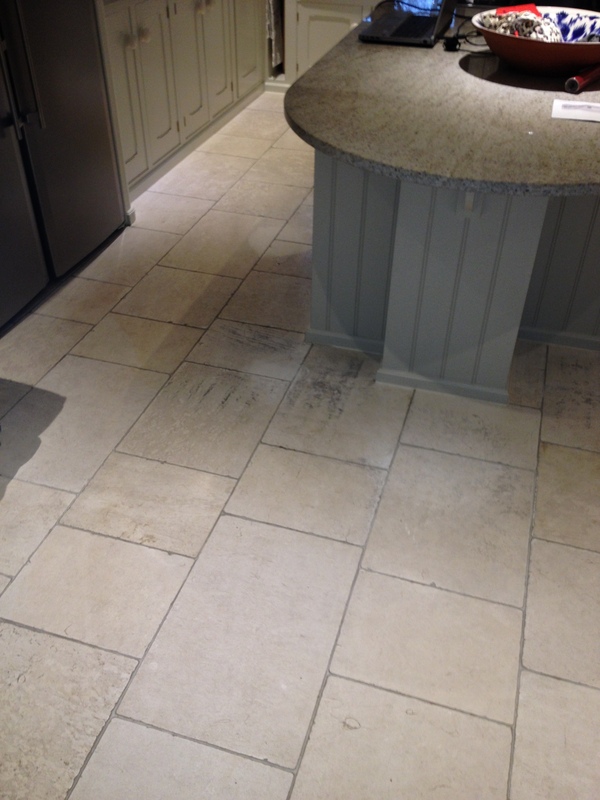 I gave the floor a scrub with Tile Doctor Pro-Clean which is a strong alkaline tile cleaning product safe to use on Tile, Stone and Grout, this was mopped onto the floor and then scrubbed in using a rotary machine; grout lines were done by hand using a stiff scrubbing brush. This broke down the soil releasing it along with the old sealer and the tiles then pressure rinsed to ensure all the dirt was removed from the pores of the tile. 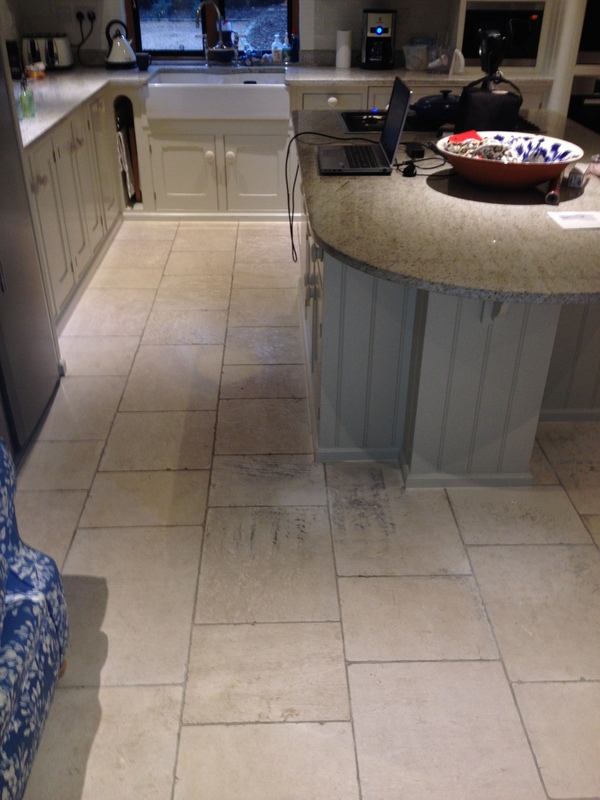 In order to remove stubborn marks, fine scratches and finish the floor was cut back and re-polished using a set of diamond abrasive burnishing pads fitted to a heavy rotary machine. 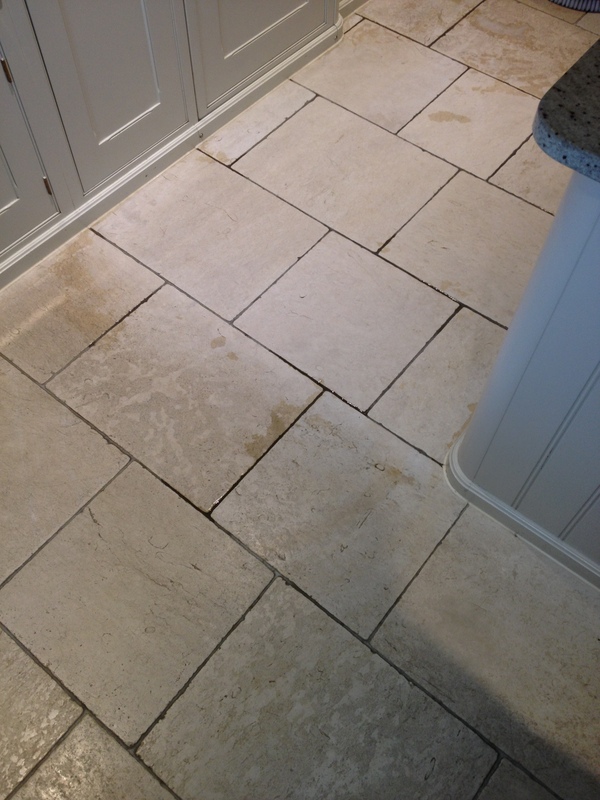 You start with the coarse pad which cuts through the stone and removes any remaining old sealer and soil and then smooth off the surface ready to receive a new seal using the medium, fine and extra fine pads until a highly polished finish is achieved. 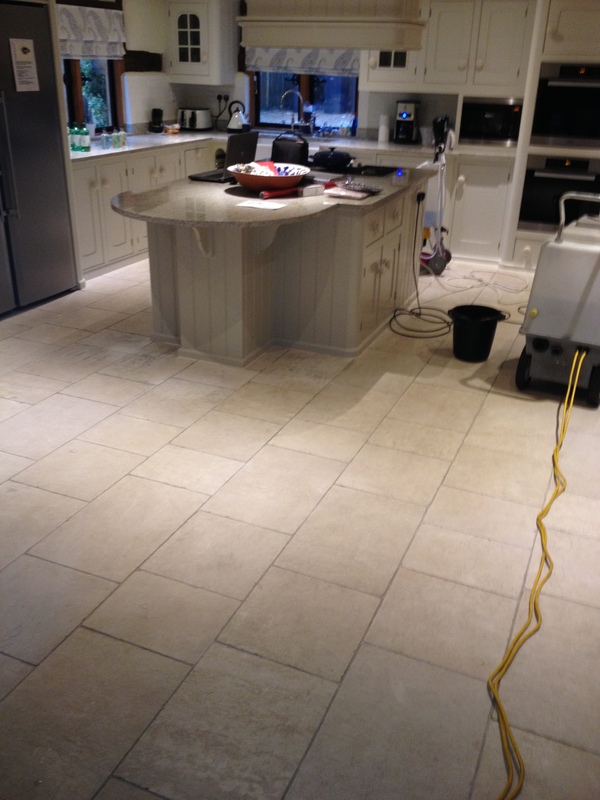 The floor was then left for twenty four hours to allow it to dry and then I returned to seal the Travertine and Grout using two coats of Tile Doctor Colour Grow. This is an impregnating sealer that repels liquid and soil so contaminates cannot become ingrained in the stone making it easier to clean in the future. 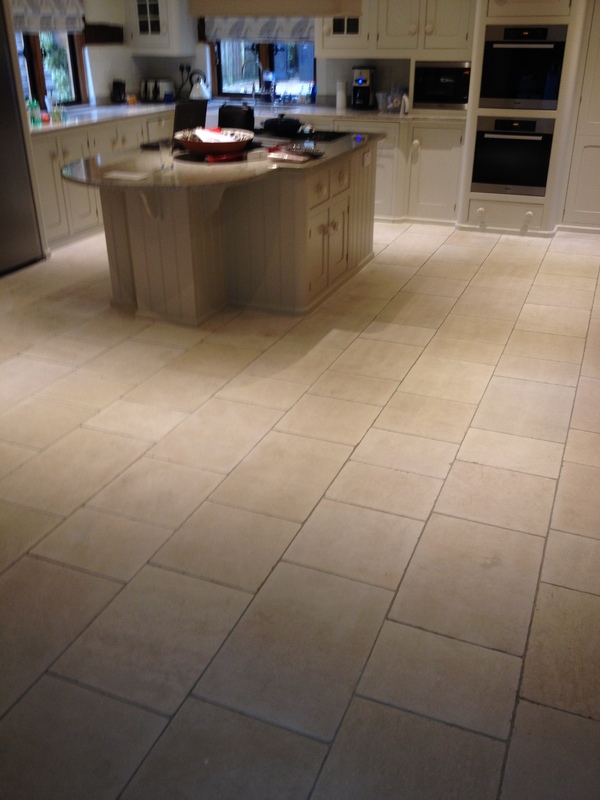 As you can see from the pictures, it transformed the look of the floor and brightened up the kitchen.